My name is KAE Galla and I’ve loved writing since before I knew how. I’d sit with my mom and grandma telling them exactly what I wanted my story to be, and they would write it down under misshapen scribbles I tried to pass off as art work. It wasn’t until years later that I finally decided to go full throttle with my passion and share it with the world. Now, thanks to the support of my loving family, great friends, and an amazing team, my dreams of becoming an author are a reality. My heart is in Paranormal Romance, and Romance in general, with "Starburst" being the first of the "A Place to Call Home" series, but I love challenging myself and broadening my horizons so you can bet there is more to come! ​ The answers to all her questions are out there somewhere, and it’s time she found them. It won’t be easy, it may even be dangerous, but it’ll be worth it. Finding her family is only the first step, from there she will have to piece her life back together as she learns the differences between who she is and who she was meant to be. What will happen when she’s thrown into a world she knows nothing about? "Ceaseless Action, Breathtaking Fight-Scenes, & Staggering Revelations! 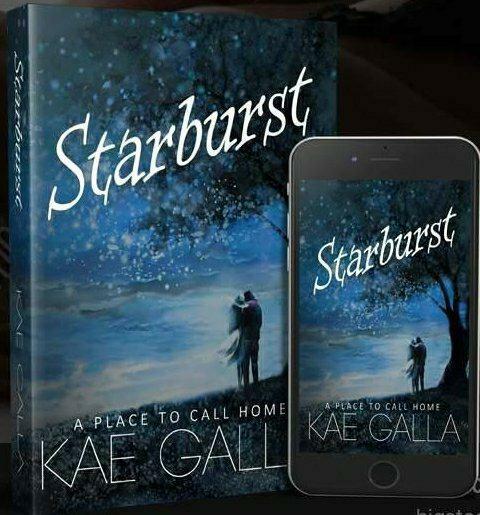 “Starburst: A Place to Call Home” by Kae Galla: A 5 Star IHIBRP Book Review!" “Starburst: A Place to Call Home” is an exciting and introspective story about a young woman on the verge of becoming something more. With few memories of her past, except what comes to her in dreams, Nova yearns to leave her human home and explore beyond “The Veil”—the place of her birth and birth-family. She’s anxious to meet her natural family, test her strange powers, and fulfill her destiny, but the traumas of her past threaten to end her life if she doesn’t find a way to cope with her dangerous heightening abilities. Galla packs quite a punch in this tense, edge-of-your-seat read. When main characters, Nova and Nash—the man she has dreamt about since she was a small girl captured and sold into slavery—set off to solve the riddle of who Nova actually is, they are faced with overwhelming challenges, physical harm, and an impending danger that can tear them apart forever. The action is ceaseless, the fight-scenes are breathtaking, the characters are fully-fleshed, and the revelations are staggering in this riveting page-turner. “Starburst” is imaginative, plucky, brave, and daring. It captures the reader from the start and never lets go. But, it is the underlying psychological issues that are presented by Galla in this novel that remain the most profound. Despite the fact that this is a fantasy read, anyone who has suffered a lifetime of physical trauma and mental abuse will relate well to Nova’s pain and anguish. Her efforts to resolve her own conflicts, as well as her deepening self-analyzing dialogue, provide an insightful glimpse into the guilt, remorse, loneliness, and other types of struggles with which PTSD sufferers must cope on a daily basis. Although “Starburst” is a work of fiction—an escapist read filled with moderate violence, magical characters, and wild adventures—Nova’s personal journey is quite relatable, and Galla’s novel can, therefore, be most helpful to those striving to understand this type of trauma from a first-person perspective. Kae Galla’s “Starburst: A Place to Call Home” is a thrilling paranormal fantasy that will leave readers wanting more, and fortunately, telling by the amazing cliffhanger at the end of this book, more will be had. Congratulations to the author on this award-winning story! This novel will be permanently featured on my website at AuthorJBRichards.com under IHIBRP 5 Star Recommended Reads!" a. I write because I love it. I also hope that other people will enjoy the stories and characters I write about. ​2. What is the hardest thing about writing? a. For me the hardest part is when it’s time to let my characters out into the world. They become real in a sense and it’s hard to let go. 3. What does literary success look like to you? a. For me, it’s not about money or fame. I’ve always wanted to write a story or series that touches at least one other person. My favorite authors have done so much for me merely through their words and worlds they’ve created. I’d love to be someone’s favorite author. a. There are so many amazing authors out there, both in the main stream and the indie world, but if I had to pick one that has been a favorite for years it would be J.R. Ward. I love the worlds she creates and the strong characters. If I could live in the world of the Black Dagger Brotherhood, I think I would. 5. What draws you to the genre? a. I’ve always loved anything paranormal, and I love stories about love. It’s my favorite genre to read and get away in. ​6. Were you good in English/writing classes in school? a. I wasn’t awful, but I struggled with the limitations a lot of my teachers put on our creative writing assignments. There is on teacher who encouraged our creativity and I will forever be grateful for that. In fact, it was a note she wrote on an old assignment of mine that got me back into writing after years of thinking I couldn’t do it. 7. Do your characters hijack the story? a. YES! All the time! One minute I’m happily writing a story, following the outline quite nicely and the next my characters take a sharp left turn and I’m left dumbfounded trying to figure out where it all went wrong. I find those are the stories that end up being the best. Stories and characters need to be an organic thing or the book suffers. 8. What is your writing style? a. I prefer to write in the first person. I feel it’s easier to immerse yourself in the world that way. As for how I prefer to write? I used to only hand write my works before typing them, now I do a mix of straight typing and some handwritten scenes before typing them. 9. Where do you prefer to write? a. My favorite place to write is at my desk with music playing in the background. More times than not, my husband is working at his desk next to mine and my cats are sleeping soundly nearby. 10. Do you write under any other pen names? 11. What is you writing Kryptonite? a. Movies. I love movies like I love my books and if I get sucked into a good one, it takes me a while to decompress and get back into my own stories. ​12. Does it help to be friends with other writers? a. Absolutely! I’ve met some amazing people through my writing! 13. What was your favorite book as a child? 14. If you could tell your younger writer self anything, what would it be? a. It would be not to worry about what other people think, and to never give up. There will always be someone out there better than you but there will also always be someone who appreciates your work as well. 15. What is the biggest thing you notice while reading, now that you’re a published author yourself? a. I find myself picking out scenes and statements for teasers and other marketing ideas, especially when I’m reading something another indie author as written.